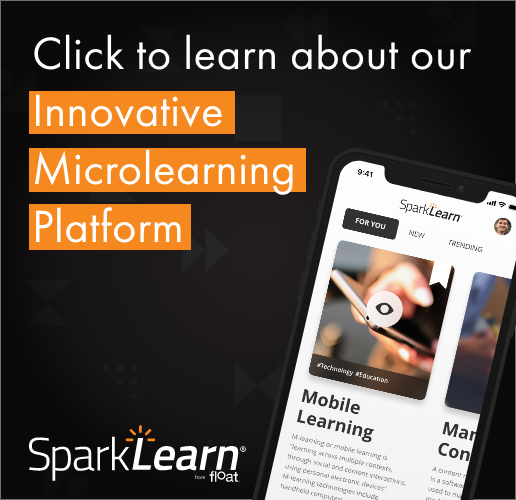 DevLearn – the world’s largest eLearning event held by the eLearning Guild on the management, design, and development of technology-based learning – is in its 13th year, and will be held in Las Vegas, from October 20-25. Float Mobile Learning will be there, with a booth in the exhibit area (#116), and several of our mobile learning experts presenting sessions during the conference. DevLearn is about all learning technologies, so in order to help you find mobile learning content and exhibitors at DevLearn, I have collected the various charts on the conference website into a master schedule of mobile learning sessions throughout the conference, and a list of mobile learning exhibitors. Session P12 Crafting Your Mobile Learning Strategy to Ensure Success Brenda Enders 8:30 a.m. -4:30 p.m. Session P20 mLearning by Design Clark Quinn 8:30 a.m. -4:30 p.m. Mobile Learning Stage Creating an Engaging in Appropriate Simulations for Mobile Devices! David Blakely 10:00-10:45 a.m. Exploring the Learning and Performance Possibilities of Google Glass David Kelly 10:45-11:45 a.m.
Sarah Gilbert, Nick Floro, Jason Haag, Steven Hoober, Clark Quinn, Chad Udell 11:00-11:45 a.m. Mobile Learning Stage Instruct, Interact, Impact: Evaluating Audience Engagement with i>clicker Dustin Jensen 12:00-12:45 p.m.
Gamification On The Go: Playing To Win Robert Gadd 1:00-1:45 p.m. Session 101 Think Small—Designing Video Training for Mobile Devices Stuart Bender 1:15-2:15 p.m. Mobile Learning Stage Expanding Access to Existing Knowledge through E-Books Dave Smelser 2:00-2:45 p.m. Session 203 A “Flash” of Freshness: Repurposing Flash Content for Mobile Development Michael Raines 2:45-3:45 p.m. Session 215 B.Y.O.L. : Build a Custom HTML Course Using jQuery Mobile, Adobe Edge, and Experience API Jeff Batt 2:45-3:45 p.m. Mobile Learning Stage Augmented Reality and Contextual Mobile Learning Jason Haag 3:00-3:45 p.m. Mobile Learning Stage Compressing Media for Mobile Devices Nick Floro 4:00-4:45 p.m. Session 307 Implementing A Mobile Learning Architecture for the Canadian Armed Forces Remi Tremblay 10:30-11:30 a.m. Mobile Learning Stage Mobile Design: Adding Mobile To Your Learning Ecosystem Steven Hoober 11:00-11:45 a.m. Mobile Learning Stage How Interactive Storytelling Reached Our Audience – and They Loved It! Kathy Burke 12:00-12:45 p.m. Mobile Learning Stage Storytelling and iBooks Author: Old-School Teaching Meets Mobile Learning Jim Hicks 1:00-1:45 p.m. Session 416 B.Y.O.L. : Go Beyond the Timeline: Building an Interactive Game in Articulate Storyline Jeff Batt 1:15-2:15 p.m. Mobile Learning Stage Jumpstarting mLearning with a Mobile Content Delivery Platform Dave Asheim 2:00-2:45 p.m. Session 508 The Agony and the Ecstasy of Going Mobile: An Eisai L&D Case Study Jennifer Hughes, Susan Caldwell 3:00-4:00 p.m. Session 601 Design and Development for the Unique Opportunities of Mobile Learning Gary Woodill 8:30-9:30 a.m. Session 608 Developing Better PhoneGap Apps Daniel Pfeiffer 8:30-9:30 a.m. Session 616 B.Y.O.L. : From Print to Screen: Create Your Own Interactive eBook! Sarah Gilbert 8:30-9:30 a.m. Session 702 B.Y.O.L. : Best of Both Worlds: Skills and Tools for Mobile Learning Lieve Weymeis, Sarah Gilbert 9:45-10:45 a.m. Session 712 The Paradigm of Continuous Learning: Mobile, Social, and Gamified Joe Pulichino 9:45-10:45 a.m.
Of course, if you still haven’t heard enough about mobile learning with all these choices, stop by the Float booth (#116) – we’d be happy to talk some more and answer all your questions. Hey nice post. Just wanted to share that my sessions are mobile focused as well. Session 215: B.Y.O.L. : Build a Custom HTML Course Using jQuery Mobile, Adobe Edge, and Experience API Wednesday, October 23, 2013 2:45 PM – 3:45 PM. As well as Session 416: B.Y.O.L. : Go Beyond the Timeline: Building an Interactive Game in Articulate Storyline Thursday, October 24, 2013 1:15 PM – 2:15 PM. Also my company eLearning Brothers #513 has many different mobile templates that work in all kinds of tools. Thanks for clarifying, Jeff. I’ve edited the post to include your information. Great thanks Adam! It’s going to be an awesome conference.